Former World Cup final referee Pierluigi Collina has stepped down as UEFA's refereeing boss after eight years for personal reasons, European soccer's governing body said on Wednesday. The shaven-headed Italian is also head of FIFA's refereeing committee, where he has been a firm supporter of the video assistant referee (VAR) system which was used at the World Cup for the first time this year. UEFA, on the other hand, has decided not to use VAR during this season's Champions League, with its president Aleksander Ceferin saying the new technology still needs more time to be developed. 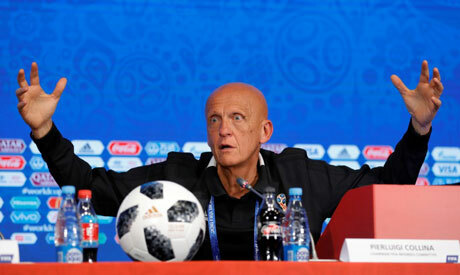 There was no suggestion, however, that UEFA's refusal to use VAR was behind Collina's decision step down from his role. "Pierluigi brought the same vision, understanding and flair to his role at UEFA that he demonstrated in the matches he refereed," said Ceferin in a UEFA statement. Under his leadership, UEFA also developed programmes to improve referees' technical, fitness and nutrition standards and ensure that knowledge of teams and tactics became part of the their preparation for every match. "UEFA has led the way in referee development in recent years and I am looking forward to the challenge of continuing and enhancing that progress," said Rosetti.